'Gwarek' (Lech Komarnicki, R. 2000). Seedling #93/5- 2A. MDB, 6-7" (14-17 cm). Early to midseason bloom. 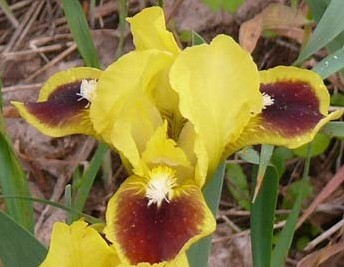 Standards yellow (RHS 7A); style arms slightly lighter; falls slightly deeper, large spot deep brown with red undertone (200B); beards white on end, yellow, to carrot in throat; lightly ruffled; slight sweet fragrance. 'Splash Of Red' X 'Bee Early'.